So I'm a bit slow off the bat, but I just realised that my AF360FGZII can only switch into HSS when in P-TTL Mode. When in Manual Mode (of the Flash) it cannot change sync mode at all. 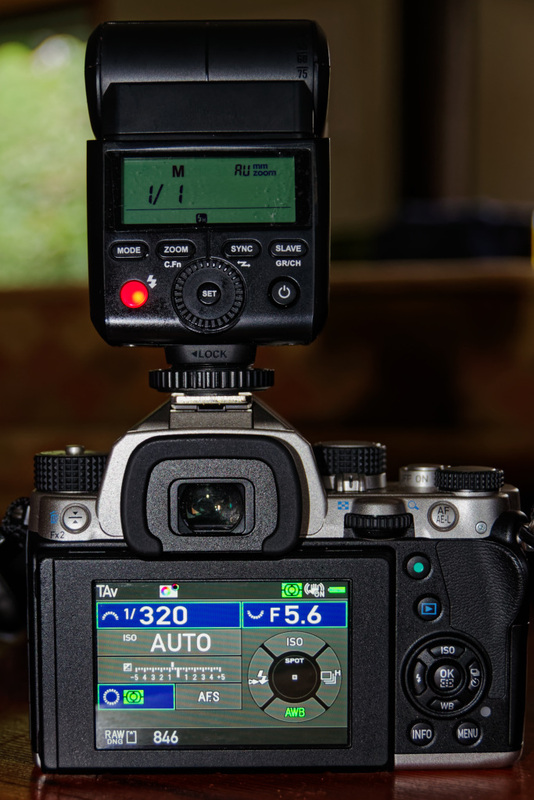 I'm wondering if there is a 3rd party flash such as Metz or something that can toggle into HSS mode whilst having manual control over the power of the flash and not be forced to use only P-TTL? With Pentax, HSS is only available with P-TTL. I have a Nikon version Godox 360AD II that however can be triggered in manual HSS mode by Cactus V6 II triggers on a Pentax. Yeah, i figured if the 540II and 360II could not do HSS in Manual but only P-TTL then that meant it would have to be 3rd party. I have the V6ii and RF60x's, I'm pretty sure I can get HSS in Manual Mode with that rig to. My question is specific to hotshoe on the Pentax camera tho, and whether it is possible? So no top tier Metz can manage this feat? I would hazard a guess that the limiting is in the Pentax protocol and that the cameras can't ask for hss except in p-TTL. The cactus inserted between the flashes and the camera can, but those made for Pentax wouldn't have the ability to do hss in other modes. The cross platform cactus it appears can however allow a flash for Nikon to be triggered for hss in manual mode. Come on all you Sigma, Shanny and Metz owners! Help us out here .... Does anyone's flash allow Manual mode HSS on the hotshoe? But Bruce, why on earth do you want it? On camera manual flash is difficult enough, surely, without adding the extra complexity (during HSS working) of having to balance every shutter speed adjustment with a compensating flash power change ....P-TTL does this for you. I have a Metz 52 AF-1 and it can’t do both at the same time. The Godox TT350-P might be able to engage HSS in manual mode. The Cactus RF60(X) for sure can (even without a V6II trigger). Are you thinking of the HSS sympathy mode? That would not work in practice, as it needs an optical triggering flash . I understood that Bruce was wanting to use on-camera flash with HSS and manual flash mode. .....(I don't think he should, it's way too much work and not efficient - P-TTL is much better for this). What do others think? How have you found manual mode HSS, in particular when you have to adjust shutter speed in response to changing ambient light .....? Last edited by mcgregni; 02-16-2019 at 11:34 AM. I have an event to shoot today, a freebee one, not paid so I am free to experiment a little. It's a cosplay shoot at some interesting locations, an entire camera club are going and we have plenty of models. It's a promo shoot for the upcoming 'Ironfest' held in Lithgow/Blue Mountains every year. Yesterday I was playing around with my 'Davo' (my mannequin). I was using my 360II and my Vello Roundflash softbox, and I wanted to see what kind of shots I could pull off in various ambient lighting conditions. Seeing as this is a cosplay shoot I wanted to step away from some FA77 shots and use instead the FA43, and gain some context of where the cosplay person might be standing in (environmental portrait if you will). Now the 360II is not a powerful flash, but I was in P-TTL mode and had the 360II set to +2.0, the Flash compensation in the K-1 to +1.0, had my ambient lighting down around under -1.0-2.0EV, and set my zoom to being max (85mm I think it is), and then stepping back from the subject a good 3-5m or so and test the shots. So then I had the idea, I wanna really shoot Davo in 1/1 power (manual mode), make sure my flash is firing full strength, step back and see what kinda result I was getting. Well! Night and day difference! It's good to know my flash has the power if need be and the shots were looking quite cool and edgy. It was around this time however that I noticed I was being capped at 1/200, and I had my EV compensation in camera set to -1.7 or something, and I had Av shift for green button (normally in Manual Mode I have this as Tv Shift), so in very bright conditions I would be shooting quite stopped down, not quite the subject isolation shots I was trying to seek. Power wise I would either back up till the 1/1 was flattering (more environment context is welcome), or just jump down to 1/2 etc. In this particular instance I would let my feet adjust the power more than mess with the power settings itself. P-TTL would be fine, if I could just gain some more additional power, I'm a little confused that everything on max seems to lack anywhere near what manual power 1/1 can achieve. It goes without saying that when getting close to the subject P-TTL is just fine (and preferred). I hope this explains the maddening reason. I was thinking I might have to rebuy a 540II as the 360II was lacking power, and really this is the only reason I have a 360II... for the roundflash softbox (and other indoor running and gunning stuff). All ocf stuff I do is Cactus. But now I think the 540II in P-TTL and HSS might be doing similar 'underpowered' shots, even when setting everything to max. Can the 540II go way higher than +2.0 in HSS? I was going to try that, stick my RF60x on the hotshoe of my camera and see if I can get 1/1 power (or 1/2, 1/4) and use shutter speeds greater than 1/200, I might try this morning quickly before my shoot. You can't use the RF60x directly on the camera with HSS, as it is a single pin basic flash type. As you saw, using the max sync speed and full manual power changes it dramatically, but at the price of small apertures in bright light. I can see why you would want to try full power manual with HSS, to see if it can be stronger than P-TTL mode. But even if you could set a flash to work like that, you won't get anywhere near the strength of effect as you do at max sync speed and full power. Once past the max sync speed then your Guide Numbers drop rapidly away, leaving you with half and even less the amount of power. The flash effect is maximal at 1/1 power and sync speed. Now... correct me if I'm wrong but the TT350P is a 'small' flash for Pentax, they were apparently working on a proper Pentax flash were they not? Maybe called V860IIP? Is that out yet? correct me if I'm wrong but the TT350P is a 'small' flash for Pentax, they were apparently working on a proper Pentax flash were they not? Maybe called V860IIP? Is that out yet? Yes the TT350 is a 2xAA powered GN35 flash. Still waiting for a Pentax version of one of their more powerful flashes with on- and off-camera TTL & HSS.